This is a quick overview for installing a Denso Alternator on a small block Mopar. This installation is based upon the Amp meter bypass. This kit is designed to work with a non-AC car; you CAN use it with an AC car only if you change the pulleys out to a non-AC and use an AC kit that changes the mounting position of the compressor. In my case all the harnesses have been replaced - all wires are new. My harness is modified because normally you would have a fusable link supplying power to the dash - I removed that fusable link and replaced it with a Maxi fuse. This does not affect the Denso Alternator install but I thought I would throw that in for info only (you will see reason why as you read through this). With the Cam and the square back 70 Amp Alternator my voltage at idle was between 13.5 - 13.7. After the conversion to the Denso my voltage at idle was at 14.1 - 14.2. The parts needed are a 60 Amp Alternator for a 1986 Toyota Truck with a factory single groove pulley, an Alternator bracket kit, Mancini Racing (part #MRE6651 - this is for an LA motor using a 1970 or later water pump), The kit only comes with the brackets, bolts, instruction sheet and wiring diagram. You will need to purchase a plug for the back of the Alternator, some NAPA 14 gauge yellow wire (Part #785504 - 25 ft roll but only need 10 ft), NAPA fuse holder (Part #7822023), 10 Amp fuse, 8 gauge wire, connectors, maxi fuse holder, a 50 Amp maxi fuse, and a Gates belt 7460 (or a GoodYear Gator back belt 15466). In reference to the plug that goes in the back of the Alternator - it does come with pig tails, however in my case, I removed the pig tails and matched up the connectors that fit inside that plug. By doing this you won't need to splice wires. In the first picture you will see an overview of the parts needed for this project except for the 8 gauge wire (I had that already installed). The second picture shows what the factory Alternator and wiring looked like (before the conversion). Picture #3: take the blue field wire (which is part of original wiring), cut off the factory connector, and install the connector that you matched up to the plug. This is your ignition ON wire. Now take the yellow wire, and after installing the connector to it, this will be your battery sense wire. You need to run the wire from the Alternator to the battery side of the starter relay using the NAPA fuse holder. In some of the links you will hear about using a fusable link - I am not interested in starting a debate but a fuse will pop and save your wiring but a fusable link will burn for a period of time and could damage your wiring; or in this case it could damage the voltage regulator in the Alternator. The fourth picture is the Alternator wired. When you compare the stock Alternator wired (picture 2) with this picture, you can see that by taking a little time you can make it look like a factory wiring job without using splices. Fifth picture you will see the 50 Amp Maxi fuse - that is the battery feed for the Alternator. That is, again, where you connect the 12 volt sense wire. Last picture - unplug voltage regulator and now you can remove the voltage regulator if you choose to do so. Remember the blue side is ignition hot so you can either tape it up and cut wires and seal them up. Hopefully this is not too long and it is helpful. I have tried my best to list all parts necessary. You are correct that the blue wire is the sense wire and the green wire is the ignition,that is how the plug is wired when you buy it.It the post I mention to remove the wires that come with the plug.There is no need to splice wires to that connector.Look at picture number Three, all I did was cut the original blue field connector,installed connector that fits the denso plug.Use the schematic as a point of reference only .The color of the wire does not matter as long as it is wired correctly.I hope this helps you. Thx for the write up,,,,I just did the swap and followed your post. Only prob I ran into was my charging wire was not up to snuffff. Rice Nuker Let the Coal Roll! Hurrayy... Voltage at idle. 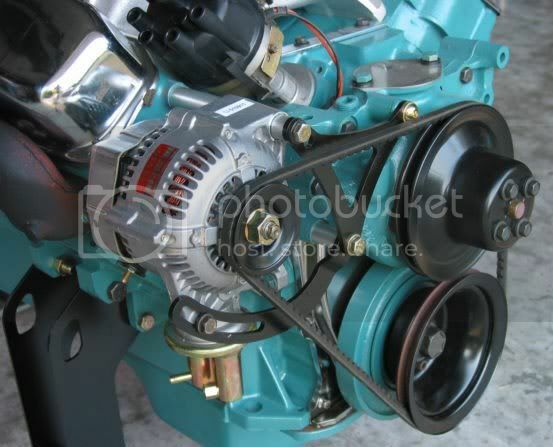 I think thats great..
For those running a slant six engine, with the cast alternator mount. Use the Denso alternator for a 88-89 Dodge truck/van with a V-8. Either 90 or 120 amp. Just cut 1/4 inch off the front of the mounting bracket, and bolt on the alternator. Wire the same as the stock mopar charging system with an electronic voltage regulator. However, you must upgrade the charging wire, bulkhead conector, and ammeter to hande the addition amp capacity. Easiest way is to just add a 8 gauge wire from the alternator to the battery positive terminal. Leave all the stock wireing as is. Ammeter will not read correctly, but will still give a charge/no charge indication. I noticed last night that my tail lights, interior lights, tag light, will flicker at idle with the cam I have and the square back alternator. My voltage gauge is reading exactly like your was ...13.7 max. I could sit in the car rev the engine up to at least 2000rpm before the flicker will go away. Is this the reason you changed over to the Denso? I know a lot of you like these Denso's, but......what was wrong with the voltage you had originally? 13.5-13.7 is certainly not what I consider "out of the box." Also, curious why you only use a 50A fuse. Seems a little light? Otherwise, nice job. Back when I had the 340 in the '70 RR body (mid '70's) I ran integral regulator Delco's, had already had trouble with "the bulkhead" and strung no8? no6? through the drilled--out connector, at the time. Can you use one of these 90 or 120 amp alternators for the 1970-up small block application like in the first post? I like these small Denso alternators, but I would need one with 120 amps because I am running electric fans, electric water pump and fuel pump...Can you supply a link on where to get this specific alternator? Yes.I run the same cam in my 340 that you use.I also did the headlight relay upgrade.With the alternator and relay upgrade my lights my lights do not get dim.It works great at slow cruise. With lumpy cam 13.7 volts under load is low and lights will get dim.The stock alternator has to be rev to get it to charge 14 volts or higher. The alternator is rated only at 60 amps ,50 amp fuse is more than adequate.The electrical load on the car is stock,no high powered stereo.no electric fans. Mopardude318 check with one of the local shops that deals with alternators . I run the Denso alternator, to handle the electrical load. I have twin inline FI fuel pumps, electric fan and water pump, nitrous bottle heater, MSD ignition, and the nitrous system itself. I use a full throttle micro switch to disable the field circuit, when making a pass at the track, so the battery has to do all the work, during a run. Then with the engine off, in the pits, I have to run the fan and water pump to cool down, and the bottle heater, to restore the nitrous pressure. Then there are head and tail lights for nite racing. I need the alternator to be able to recover the battery while driving to the staging lanes, and back to the pits after the run. MD318: you can run the denso alternator, as long as the brackets are correct for it. If you don't have the correct brackets on the engine, now, I think the one from a 88-89 360 truck should work. Make sure you increase the size of the "hot" wire, to handle the increased current available. Any parts store can supply this alternator (rebuilds of questionable quality), but the best place is the salvage yard. You can get the alternator and the correct brackets at the same time. Im going to try this first,,, then go the Denso alternator or equal. "A constant 13.5 will not over charge a battery, in fact the max output is 15.5 just like a reg. voltage reg. My 67 Plymouth had the same problem with the dimming lights at idle due to a radical idle. The high output electronic reg. solved the problem. I figure the stock regulator works like most battery chargers giving the battery more voltage * amperage when the battery is low or the system demands it. A constant output VR running at 15.5 will eventually overcharge the battery and blow components that are sensitive to high voltage like light bulbs maybe the stock type ig module as well. The factory gauges may not be accurate... I would prefer and reccomend properly regulated voltage from idle to nine grand rather than overvolt situation. Delcos maintain nicely at stock idle, and look dumb as well. You all need to remember one thing. A voltage regulator limits the max output of the alternator. If the alternator will only put out 12.5 volts at idle, no regulator is going to cure the problem. The output at idle is a function of alternator design, and alternator rpm. Read carefully about the voltage regulator. All I know is this, I have the late model charging system with a mopar square back alternator that is 75 amps rated (I think it was been awhile). While my car is at idle the voltage needle jumps around for a shade less than 13 to 13.7 With the lights flickering. If rev the engine and hold it at 2k rpm it goes away, however the voltage jumps up to 14 and stays there. I've ordered the Mopar race only VR and will let you know how it goes. More than likely o1heavy that will be the case. One thing that I don't understand is if I remember correctly my stock mopar alt is a 75 amp. So how does the 60 amp Denso work better than a 75 amp... the sense wire? Also I have March pulleys and I'm not sure how easy it will be press my pulley off the stock mopar and then install it on the Denso. I had to use Locktite press fit compound when I pressed the pully on. It is a long story but that's where I'm at on that. lol That's another thing against me is the March pulleys but I want serpentine belt system. Update: yeah I think Im screwed having the March pulleys and expecting the pulley to fit the Denso alt. I should do that. I have entirely new wiring through out the car, aftermarket gauges, 4 ga wire running from the alt to the starter relay. Headlight relays, electric fan, Accel 300+ ignition, battery is in trunk, no radio. Just some info on what I have. Well I tell the problem(s) I believe will occur with the March pulleys, a) the pulley is machined to fit the diameter of the opening of the mopar alt housing. Not altogether sure about the Denso b) the pulley (looking at your picture) will be out to far. But that is still questionable.